Demolition of cottages, Commonside, Ansdell 1948. The march of progress is slow but inexorable. It sweeps all before with neither feeling nor consideration. When progress takes its next step in Lytham one of the last vestiges of the old town, the white cottages in Commonside, Ansdell, will be removed from its path. The cottages are scheduled for demolition and at present the Clifton Estate, who own the cottages, are being consulted on a proposed road improvement plan at Gordon Road. Three years ago Dr. J. P. Litt, late medical officer of health, condemned the cottages as unfit for habitation. The war and lack of materials prevented the pulling down of the cottages there and then. Until now they have been spared and may be spared for some little time yet, until labour is available and fresh accommodation found for those occupying the cottages. These 200-years-old thatched cottages at Commonside are to come down some time in the future to make way for a road improvement. They have been condemned and a tarpaulin covers part of the roof of one cottage. There are now few thatched houses in the Borough. It has not been possible to establish the exact age of the buildings. No deeds or plans for them exist, but it is known that they are over 200 years old. There are plans in existence for buildings in this area erected 200 years ago, so it is probable that the cottages are nearer the 300 years mark. Some of the timber contained in the structures, three of which are occupied, is oak, and may have come from wreckage of vessels plying in the River Ribble, as under the rights of wreck, land owners often used wreckage found on the beaches of their land to help in building. The walls are known as the clay “clumped, stood, raddled and daubed" type. This means that the clay was shaped into bricks (clumped), the bricks were then placed in position (stood) then they were cleaned off (raddled) and were finally daubed. 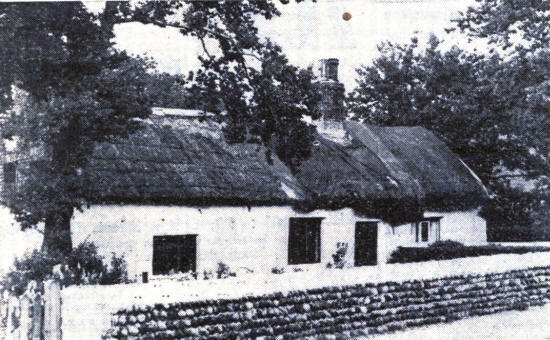 For the cottages, the days of the golden thatch are gone Their heads of glory are now shrouded in water-proof tarpaulins and only ragged, blackened ends of the old thatching are visible. The roof on one of the old homesteads has fallen in completely and in it birds are nesting and weeds growing. But the other dwellings are quite sound and still draw- approving remarks from passers-by seeing them for the first time. They constitute a sight rarely seen now. The cottages were built for workmen employed on the lands of the Clifton Estate. Mrs. Annie Garside, daughter of John Cartmell, a cowman with Squire Clifton for 30 years, still lives in one of the cottages and has done so for 65 years, since she was three years old. Her cottage contains photographs and other links with the past glories of the Clifton family, of the Rossalls and Balls who were among the oldest of the town's inhabitants. Mrs. Garside regales her visitors with stories of the days that were, of George Dugdale arriving with his sheath of knives to slaughter a pig and of 50Ib. hams hanging from the beams. Of the times when people made their own entertainment and for whom life was hard, but happy. What will happen to the inhabitants of the cottages? I learnt at the Town Hall that the cottages will not be pulled down until further accommodation has been found for those living there now. Furtherance of modern ideals demands that the cottages go. It is for the ultimate benefit of the community and must be regarded as a regrettable, but necessary evil.